About | Levine's General Store: The Gluten-Free EatUP! Why a Gluten Free Market? For many folks, eating gluten-free is not a choice. It is the only option and can be a matter of life and death and chronic pain and illness if you have Celiac autoimmune disease, gluten intolerance or sensitivity. For others, avoiding gluten may be a choice or path towards feeling well. Whatever the reason, gluten-free foods don’t have to be sad and tastless. Our goal is to present some of the tastiest gluten-free products available, in a fun and casual setting, to provide a platform for a community of merchants and customers and friends to Meet. Eat. Be Free. Just because you have stopped eating certain foods, doesn’t mean you have to live without taste. You still have cravings! You can still be a foodie. We believe in the gooey, the crunchy, the salty, the sweet, the healthy and the guilty pleasures, with the fewest ingredients possible. It can all be done, gluten-free, taste-full. Good food brings people together. We come to this endeavor with so many people in mind, you and you and you, as well as our own family and history of celiac disease, great cooks and good times around assorted delicious foods (you know, the kind of folks who sit at one meal while planning the next?). When you are gluten-free, sometimes you feel like you are on the “outside.” Not at the EatUP! Enjoy an afternoon of foods and good times. Meet local merchants, discover new foods, some items less likely found at your local grocer, and new favorites. Delectable delights that would never have gluten, and appetizing adaptations of foods that traditionally have gluten. Socialize and mingle as we share gluten-free foods we have tasted and love, and want to share with you. We are a roving marketplace that operates through pop up venues to provide some of the tastiest gluten-free delights. Levine’s also produces signature foods such as Yum Pies, savory, hand-held pockets enveloped in a crisp pastry crust. Think of it as a Yum-panada. The Gluten Free EatUP! was co-founded by Levine’s General Storeowner, Deb Goldstein and Kimcheelicious food designer Antonio Limuaco, to broaden access to some of the most innovative, local gluten-free makers and the tastiest products, in a fun and casual setting. 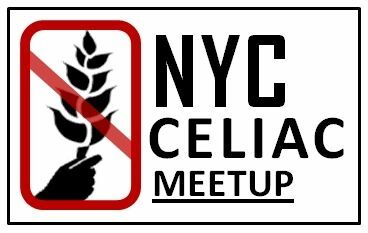 We provide a platform and culture of sharing for a community of merchants and customers – while dispelling some of the myths about Celiac-Disease and gluten-free intolerance, along the way – to Meet. Eat. Be Free. We have been featured in Time Out, Edible Brooklyn, Edible Manhattan, NY1, News12, Gothamist, Village Voice Fork in the Road, Markets of New York, Gluten-Free Steph, Harlem Food Local, South Slope News, DNAinfo, Gluten Free Jet Set, Park Slope Stoop Top 100 list of 2014 for “making gluten-free food more accessible in the neighborhood, ” and more…. For over ten years Deb Goldstein has been the small business owner of MissWit Designs, a successful, pop-culture line of t-shirts, promotional products and design, in Brooklyn. Upon learning about her 4-year old niece’s diagnosis of celiac autoimmune disease last year and knowing the history of both her grandmother and mother being celiac, she started to pursue a new venture. Recognizing that although awareness and gluten free food product selections are growing at a rapid speed, there are still few places where people do not have to worry about cross contamination, or facing disbelieving ridicule from strangers. She started to dream of creating a “safe food space” where no gluten had ever entered and is currently working towards opening a brick and mortar store, Levine’s General Store – Gluten Free Provisions. She is an auntie, a t-shirt designer, a jokester, a social-worker, but not a candlestick maker. Kimcheelicious.com Fermented Food Design. Founder Antonio Limuaco is a fermented food and culinary innovator. Kimcheelicious produces fine-aged vegan kimchee, a healthy, gluten free food with a deep, hearty flavor and a tart finish. This Korean staple is eaten with meals or used as an ingredient in cooking. Inspired by the rich pallet of flavors from his youth growing up on Guam, an island where Korean, Japanese, Chinese, Filipino, Portuguese and Spanish, cultures converge Antonio creates recipes, and new ways of making and cooking with kimchee, that challenge and excite how we think about food. You can find some of these creations in his upcoming ePUB cookbook Korean Tapas for American Tables. A collaborator of various artisanal disciplines, he is the creator of Levine’s General Store’s signature foods like Yum Pies and co-conspirator on the development of their GF grilled cheese. He is also the co-founder of The Gluten-Free EatUP! Market. When he is not busy producing kimchee, he is teaching, doing radio interviews and presenting workshops on all things fermentation. Freddy’s Bar and Backroom After escaping the dark clutches of eminent domain, this one-time prohibition bar did rise again. Known for an eclectic interior which reflects its colorful clientele, Freddy’s Bar IS a creative hub for artists, filmmakers, writers and musicians – and now food makers! Former bartenders Don O’Finn, Matthew Kuhn and Matthew Kimmet became the driving force to continue this vision, and with community support Freddy’s Bar now thrives in Greenwood Heights Brooklyn. Freddy’s Bar considers its staff and regulars as family. All are welcome. Freddy’s was a vital part of its previous neighborhood and reigns so in its new one. Deb and Tony are friends and partnering in gluten-free adventures. They first met, most likely, at a post protest/rally party at the original Freddy’s Bar! General Information The Gluten Free EatUP! is free to attend. While the event is open to the public, Freddy’s is a bar…Families with children and folks under the age of 21 are advised to have adult supervision at all times. ATM on site. *For our Celiac & Gluten Free Friends: Please note that Freddy’s Bar is not a gluten-free establishment. Food at the EatUP! will not be prepared in the Freddy’s kitchen. Merchants selling at the market produce their products in a variety of facilities, with a variety of scenarios. For example: separate equipment in a shared kitchen or a completely dedicated gluten free facility. Questions can be directed to individual vendors/merchants as well for further clarity. While we cannot 100% guarantee, please know that we are taking every effort and precaution to avoid cross-contamination.